I love as Annie sites with Leah in the hospital, as Leah is on bed rest, that they work together on the quilt. They take each of the fruits of the spirit as they sew and tell a story from their lives of a person or event displaying that fruit. The stories helped pass the time for both of them, and encouraged them to rely on God during this difficult time. The Sunbonnet Sue/ Overall Sam quilt was great for a Baby's first blanket and the stories told on each block were like a story within a story in the book. I prefer Christmas books to be light reading, nothing overly sad, and thankfully Vannetta Chapman delivers with this story. (Spoiler).. There is nothing heartbreaking which I was thankful for. I loved the cast of characters. I enjoyed getting to know Annie who went to school to be a nurse and returned to her Amish community to help there. 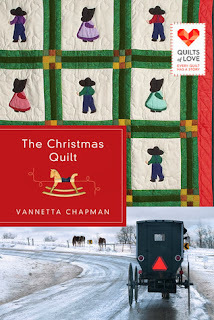 Great addition to the Quilts of Love series! Thanks, Melanie! So glad you enjoyed Annie and Leah's story!